President Donald Trump praised Dallas Cowboys owner Jerry Jones on Friday morning for his stance on players standing during the national anthem. Trump tweeted: “Way to go Jerry. This is what the league should do!” He included a link to a Fox Business article that referred to Jones saying that Cowboys players should stand for the national anthem. With the NFL season slated to start in just over a month, the league has been grappling with how to deal with players taking a knee, sitting down, raising a fist, or engaging in other forms of protest during the playing of the “Star-Spangled Banner” before each game. Jones on Wednesday said that his players will have to stand on the sidelines. “Our policy is you stand during the anthem, toe on the line,” Jones said, according to Fox Business. 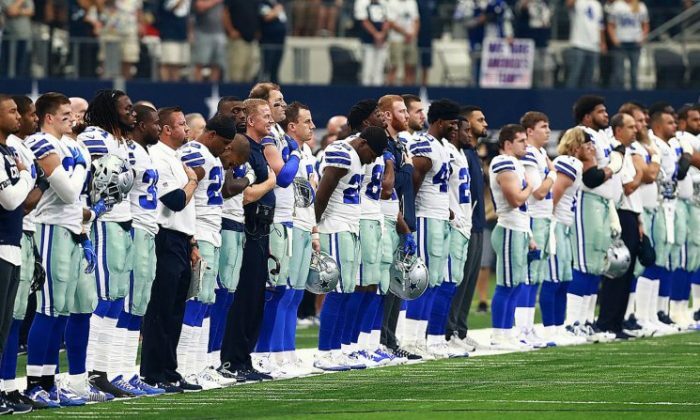 Since before the start of the 2016 season, players have protested during the anthem in an attempt to highlight police brutality and perceived racial injustice. Last season, Trump said that players were disrespectful, saying that those who protest should be fired. As a result, it triggered a wave of NFL protests during the national anthem, with at least 200 players partaking in some form of protest the Sunday after Trump made the comments. Their protests were generally met with a chorus of boos and jeers from the crowd. A Yahoo News/YouGov poll in late May showed that a significant number of NFL fans favored the league’s new policy requiring players to stand. “When asked if they support or oppose the new policy, which states teams will be fined if players ‘do not stand and show respect for the flag and the [national] anthem,’ 53 percent of self-described NFL viewers said they support the policy, with 32 percent opposing and 15 percent saying neither or no opinion,” said Yahoo. Last season, a survey found that 30 percent of NFL fans are watching less football. At the time, half of those self-described “fans of the NFL” said that they’re watching less because of players protesting during the national anthem, according to a Seton Hall Sports Poll, conducted by The Sharkey Institute. Some 52 percent said that they disagreed with the protests, according to the New York Post.